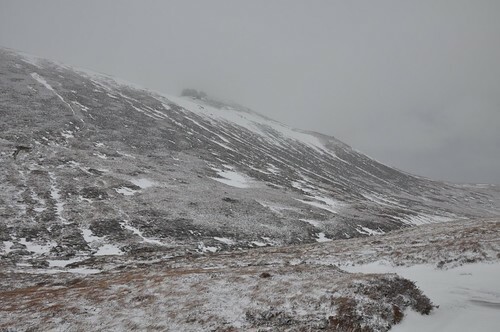 A Cairngorm traverse over the high pass of the Lairig an Laoigh. 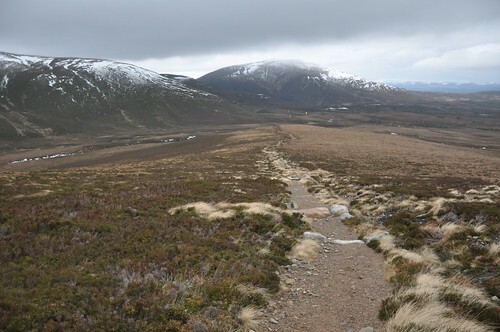 A few years ago myself and Stephan decided it would be quite a nice idea to walk the two high passes of the Cairngorms. 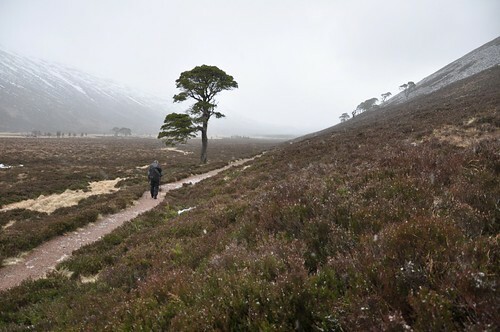 We duly set out from Linn of Dee near Braemar and headed for the Lairig Ghru. 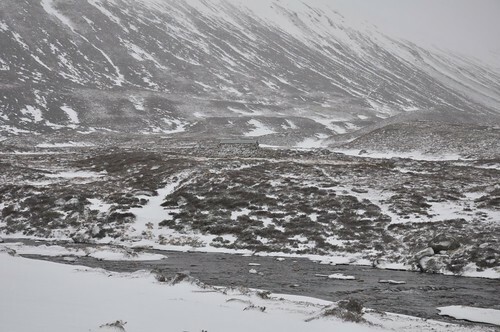 We got as far Glen Luibeg before deep snow drifts below Carn a’ Mhiam had us wading waist deep through the white stuff, it didn’t take long to realise it was a futile exercise without skis or snow shoes. With the Shills winter meet arranged for Aviemore I thought it would a good idea to resurrect plans and give it another go. 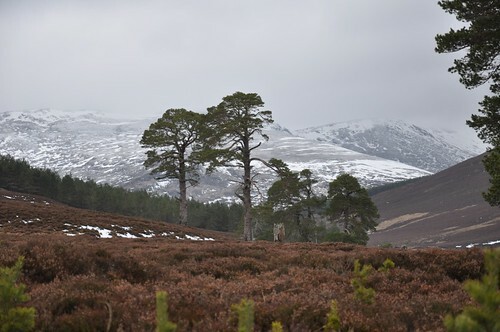 The Cairngorm lodge hostel was again booked and we were all set, all we needed now was some decent weather. Things looked quite promising at the start of the week but soon deteriorated as the weekend approached. One half of the party decided that the weather was going to be to dire so decided to cancel. I was not expecting it to be good but hoped it wouldn’t be so bad. 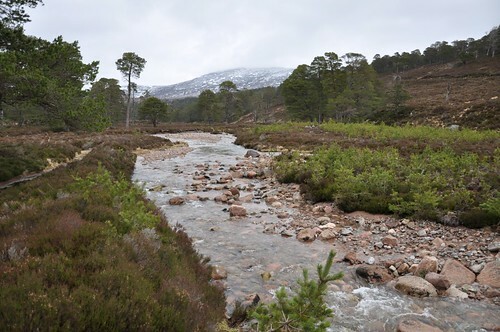 Up at 5 and I was heading to Braemar by 6, on arrival at the Linn of Dee another bowl of porridge had me fuelled and ready for the off around 8.30. Only half a dozen other brave (or fool hardy) folk were to be seen at the car park. 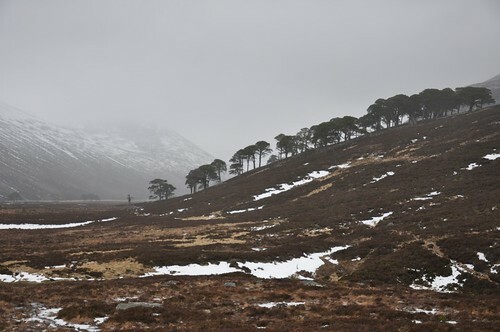 While it was a bit on the grey side and the clouds were fairly racing across the sky it didn’t appear to threatening, in fact the wind was little more than a stiff breeze as I made my way up Glen Lui. 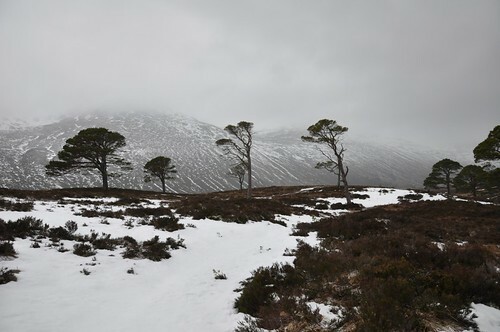 By the time I’d reached Derry lodge I had decided to stick with my planned outward route so headed up Glen Derry toward the Lairig an Laoigh. 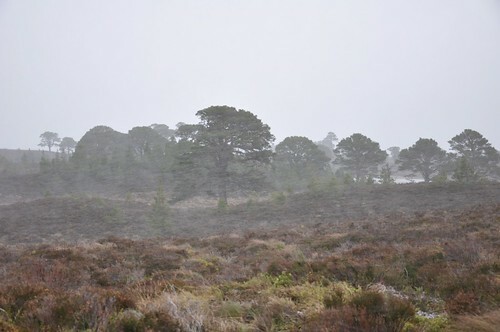 I crossed the Derry Burn to take the path along the west bank enjoying the stroll through the pines. 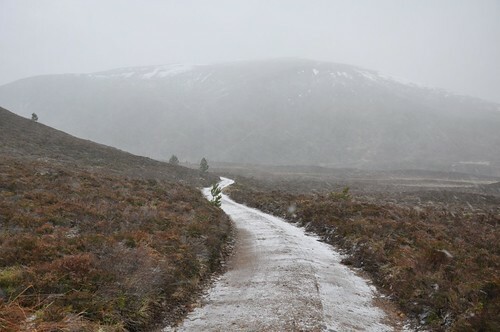 After re-crossing the burn to pick up the main path the first snow flurries of the day started to reduce visibility a little. 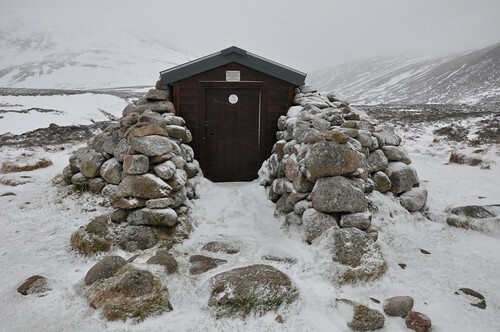 I had a chat with a group of four guys who had been out making good use of Corrour bothy before enduring a gruelling day when traversing Ben Macdui to reach the revamped Hutchison hut were the stove had raised spirits and the temperature overnight. 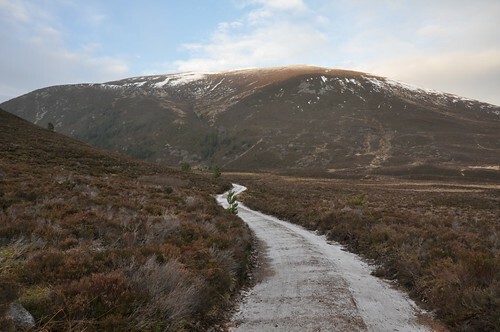 The paths had been clear of snow and ice so far but this changed as I started the climb up and over the pass. It was tough going at times as I sunk in the snow and tried to avoid the harder icy patches. 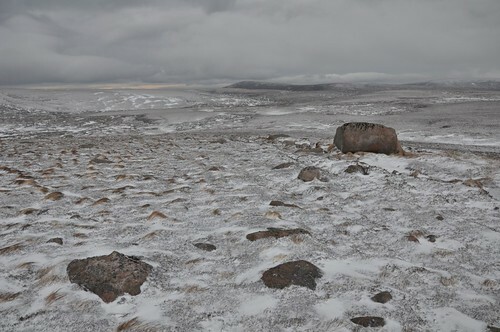 The path was difficult to follow in places but even when on it the ground underfoot was snow covered and icy. Initial progress seemed good but then slowed as I made my way to the Fords of Avon. I was a bit wary when having to cross some snow bridges but I managed to find packed snow and made it to the River Avon with dry feet. I couldn’t locate enough stepping stones to totally bridge the river but elected to take a couple of quick steps in the waters with boots on rather than paddling. A good result really, hardly any ingress, a combination of gaiters and waterproofs keeping most of the water out. It was now a little after 1 so I took advantage of the Fords of Avon refuge to get a brew on and enjoy a sandwich. I had been hoping that the weather would be good enough to allow a crossing of Bynack More but as it was thought I had more than enough walking still to do without adding to the day. 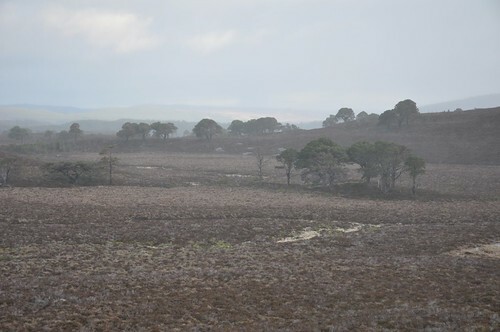 Having passed beneath the Barns of Bynack I began the steady climb out of the pass onto the high ground to the north of Bynack More. It was only up here that I got a true taste of how strong the wind was. It was fairly gusting but fortunately at my back. I had donned micro spikes on the climb onto the shoulder and was glad of them along this part of the path. Looked like a new path has been put down along this section and while it helped I was starting to feel a stiffness creeping into my legs. My fitness levels were obviously not as good as I hoped, hardly surprising as this was my first proper outing since the end of October! Down in the glen it was easy to think I was almost there but I knew I still had a good hour or so to go. 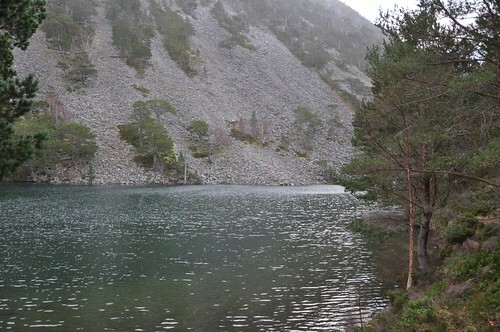 I passed the Green loch in the gloom and it was just about dark by the time I reached the Cairngorm hostel. There was not much time to relax, a quick shower and change before catching a taxi to the Winking Owl. Met Donald on arrival before the rest of the guys started to filter in. A good meal and a few beers followed as I started to put some faces to names. It was a very enjoyable evening but very much aware I needed to make an early start I made an earlier than wished return to the hostel. A hot shower in the morning did little to ease the stiffness in my legs but things improved slowly as I made my way up the Ryvoan pass. 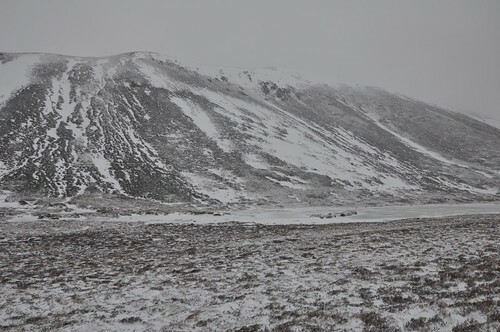 Passing heavy snow showers gave an indication of the wind strength but again in the pass it was quite calm. I got a bit of a buffeting as I turned east around Creag nan Gall. Looking back at Meall a’ Bhuachaille the general outlook seemed to be improving, there was even a little blue sky. 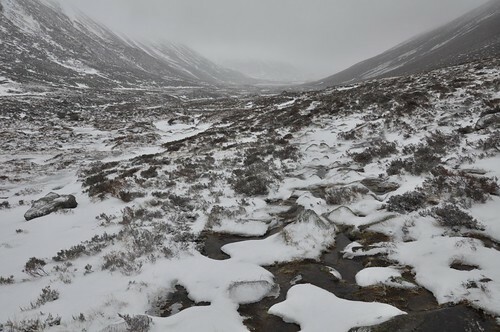 Soon though the snow returned and as I reached the entrance of Strath Nethy it turned into a full on blizzard. 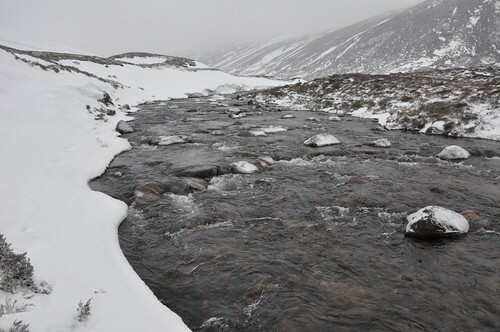 I stood a while squinting into the distance up the Strath wondering whether it was a good idea to continue. Head down leaning into the wind I started up the Strath. Granite boulders provided a footway above the boggy ground but never felt secure. I plodded on for a while before again stopping to consider my position and options. Again I started forward but soon stopped, was I really up to struggling through this for another 6-8 hours? My journey out had been quite tough but any wind was always at my back now it was head on and quite fierce even down at the glen floor. I can be quite stubborn when committing to a walk and always find it a tough decision to turn back. This was not the first time though and probably won’t be the last but I decided it was time to turn around and head back to Aviemore. It was a couple of hours before I reached Glenmore lodge but I then got lucky as the first car that passed stopped as I put my thumb up for a lift. It was one of the chefs just off shift and he kindly dropped me at the railway station. I thought my luck was in again as it was only 20 minutes until the next train arrived, unfortunately there was a 2 hour wait at Inverness before the Aberdeen train would depart. 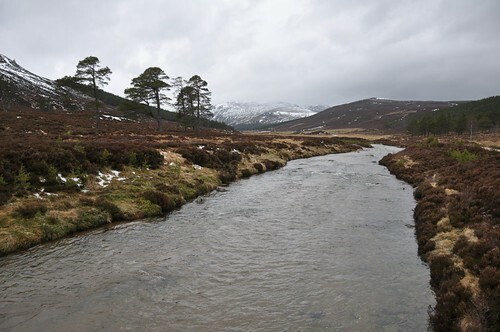 The other consequence of getting the train back was that I still had to head down to Braemar to recover my van! I had been hoping to take a bus but wasn’t sure if they were still running, fortunately my better half offered a lift. Fours hours later we were home, it had been a long day.